This year, we made a personal goal to reduce the amount of gas we use for lawn care. 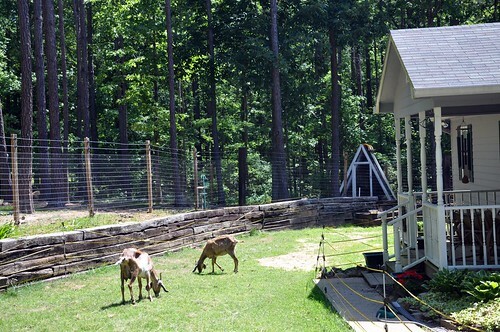 We decided to officially retire my grandfather’s old Statesman riding mower and use the goats to mow instead. timberland homme ugg outlet france A few strands of temporary electric fence and fiberglass posts later, our small goat herd began to mow our roadside ditch. We also wear our dirty “yard” clothes several times before washing them. ugg australia pas cher While it may sound gross, it sure saves water and resources when it comes to laundry. I could easily do a load of laundry every single day because of farm work. iphone 6 cases mickey mouse Of course, sometimes we get them entirely too dirty to think of wearing them again. canada goose pas cher plain iphone 6 case white Example: When I helped to deliver Apple’s kids, I got covered in blood and slime so I set my clothing to soak as soon as I was able. But let’s get back to the yard. ugg australia magnet case iphone 6 Shall we? In order to run the temporary electric fencing, we must clear the path for the fence so that branches, weeds, and tall grasses do not interfere with the current. We walk the future fenceline and clear as much as we can by hand and set the corner posts. nike air max 90 femme We use the weed eater sparingly in order to knock down any grasses along the path. soldes puma sneakers Then we run the wire around the perimeter making four laps all the way around (at a minimum). We like the electric woven rope wire best because it’s easy to put on a spool or one of those wheels used for storing extension cords. After running the wire, we place more temporary posts about every six feet and feed the hot wire through the proper insulators (our posts have them built in). doudoune canada goose pas cher soldes puma chaussures We turn on the current and let the goats in to graze. The picture above shows Apple a week before giving birth to twins. Would you look at those sides? 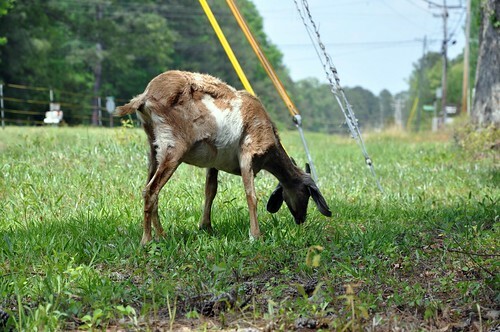 Anyway, the goats ate right up to the road, along the driveway, and even our front yard. Afterward, the lawn looked positively manicured in just a few days. 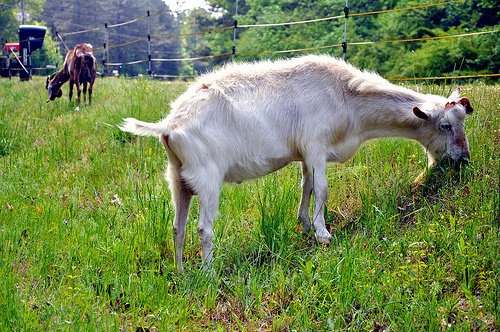 The goats seemed to genuinely enjoy their roles as day laborers, too. Rosa - They are the best lawn mowers together with sheep!